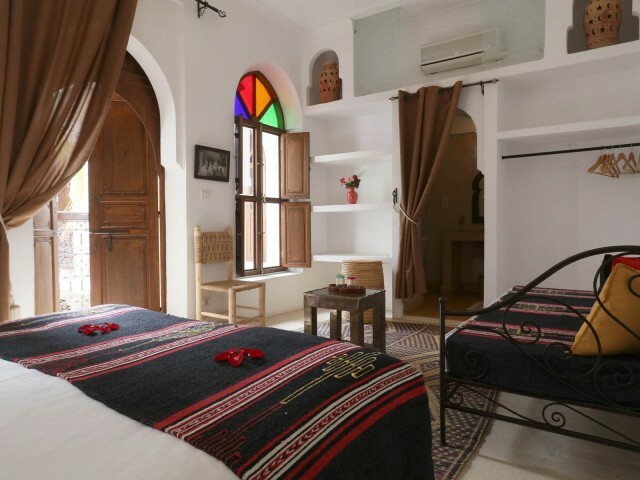 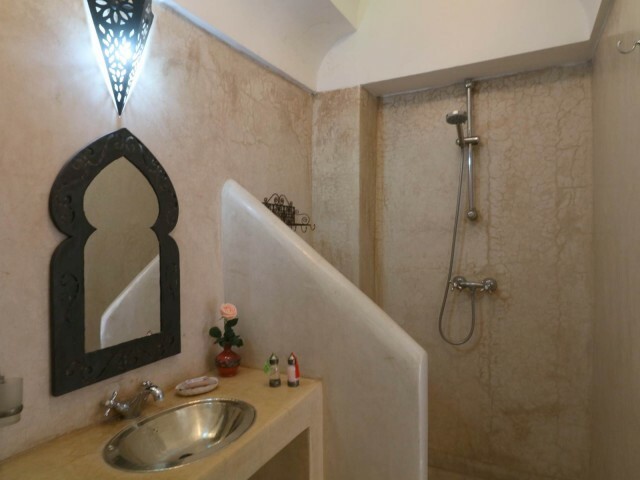 Riad Zenithya authentic Riad of Andalusian style situated in the heart of the medina at 2 not the Majorelle gardens, 10 minutes from museums, Djemaa El Fna square and the Royal Golf combines tradition, modernity and comfort. 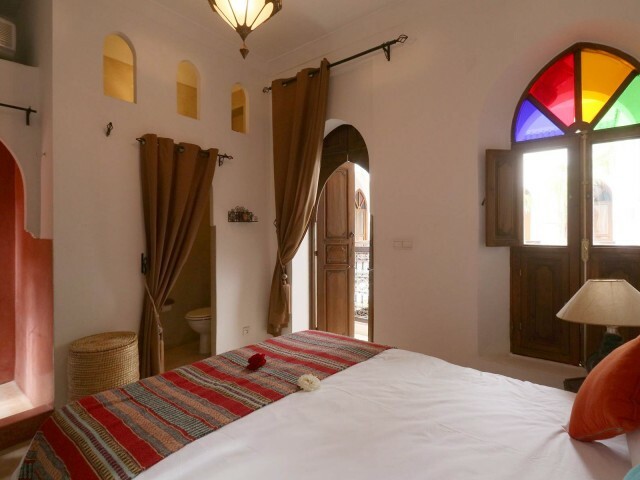 Owners wanted for its decoration offer you the warm colours of the Morocco: rudders, ochre, red Marrakech. 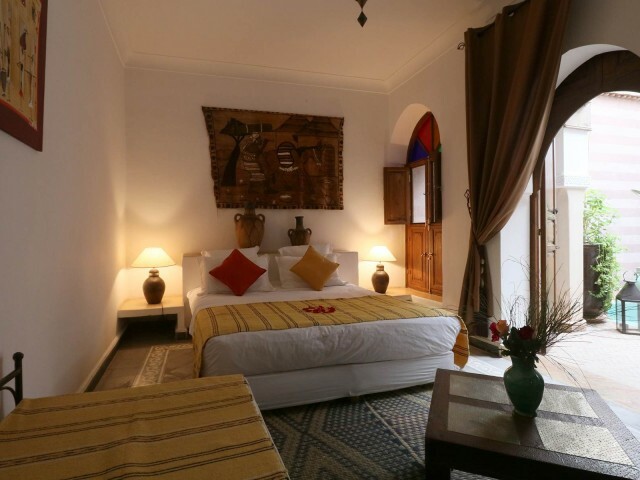 Rooms are adorned fabrics Berbers, the soil is in from former and walls in tadelakt. 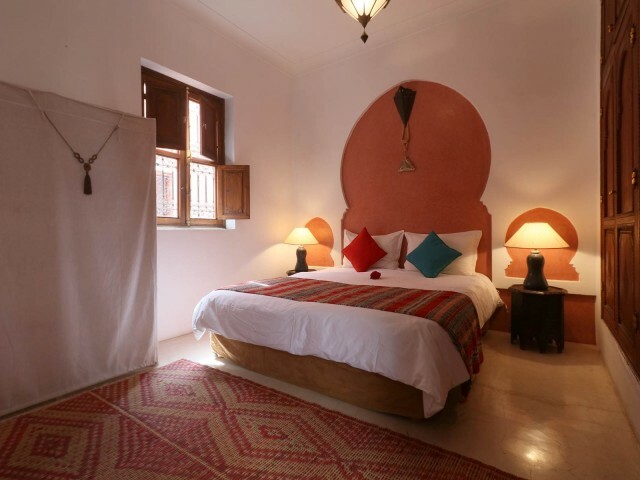 Moroccan craftsmanship is in the spotlight in this remains authentic. 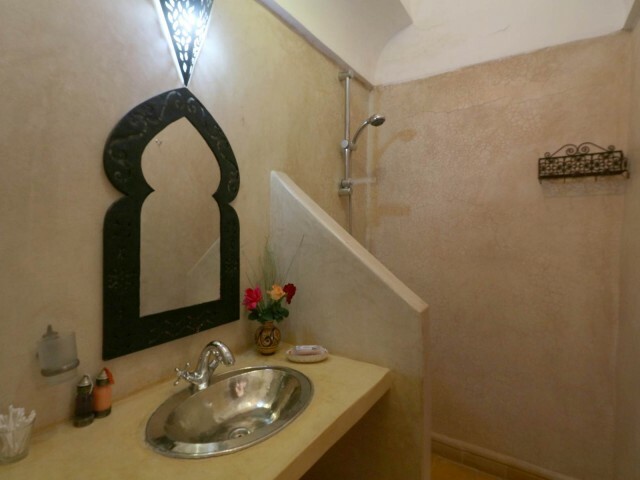 At the salon, of the great superbesmasques so is next to the fireplace. 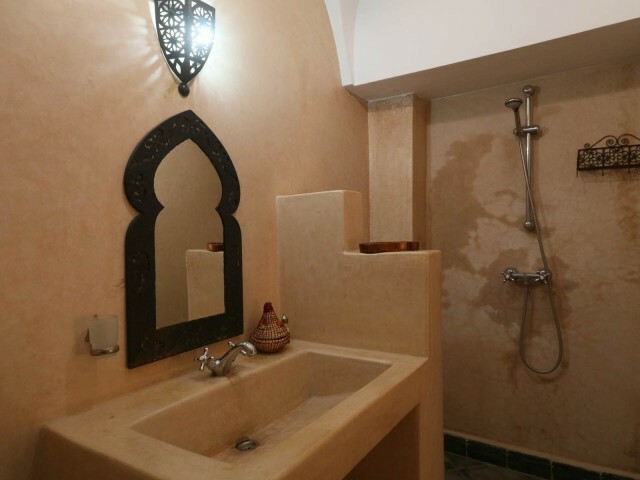 Tender green zelige basin finds its place within the clear patio and spacious. 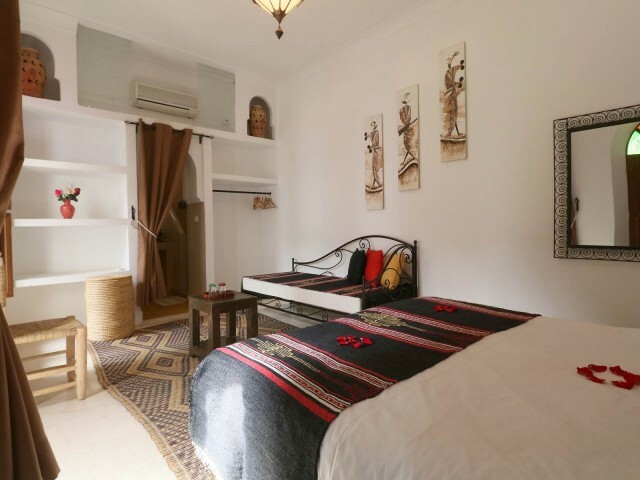 Meals can there be served, as well as in the dining room or terrace. 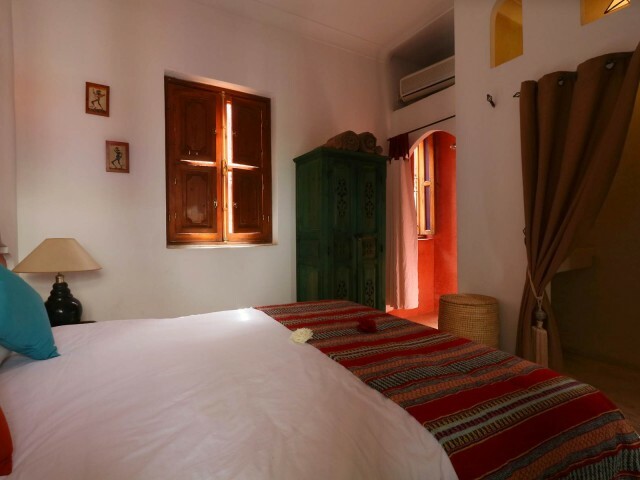 Each morning you choose traditional menus in the company of A? 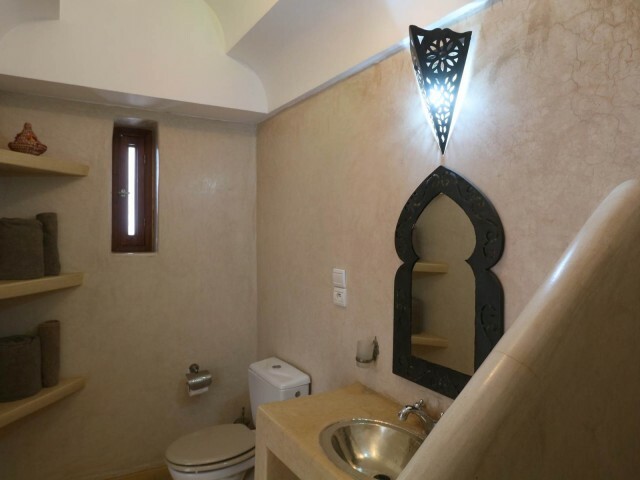 cha. 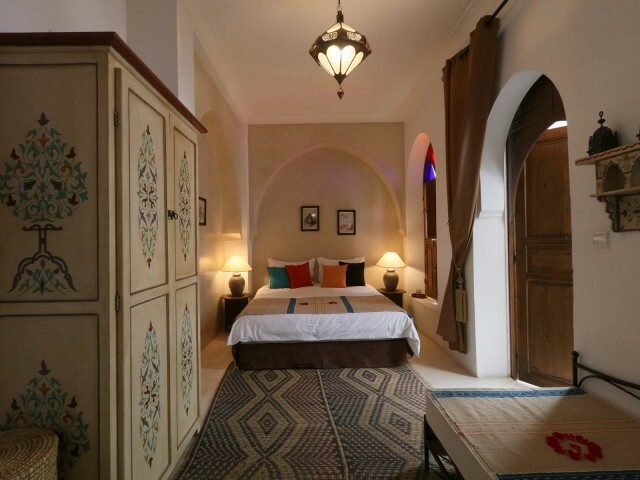 Riad Zenithya by his easy access to Bab Doukala, near the ramparts allows the charm of the medina to the District of Guéliz trendy and modern. 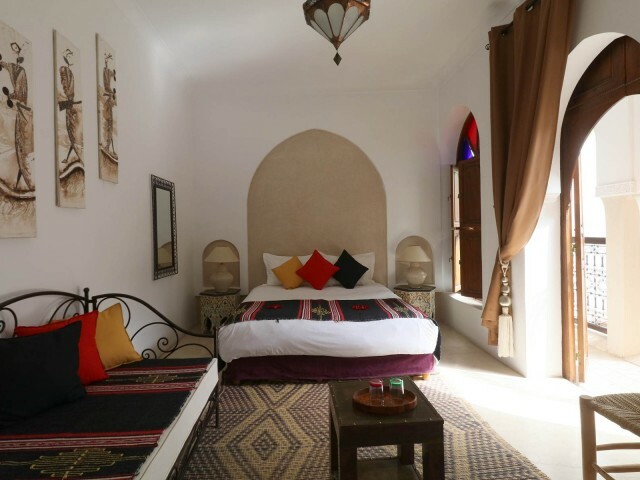 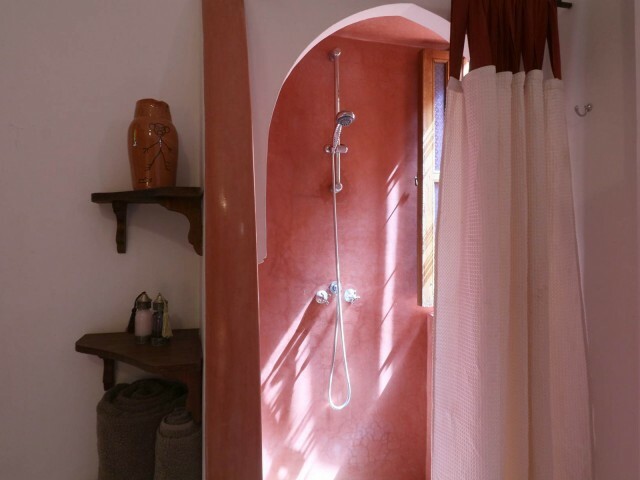 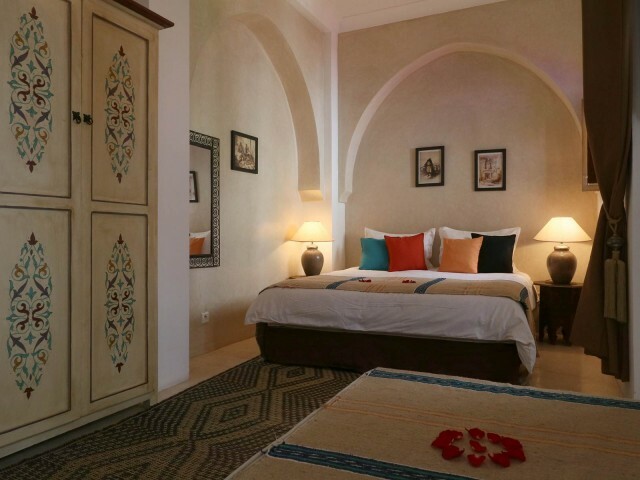 Located on the 1st floor, they have a large bed 160 x 200 with possibility of 2 beds of 80 x 200.The Red ambiance of Marrakech, the trimmings of the souks of the medina invite us to the discovery of the craft Malik.These 2 rooms also have their private bathroom as well as air conditioning. 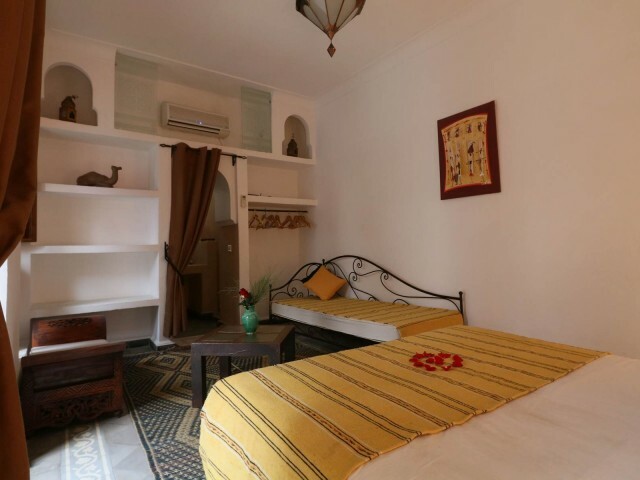 Located on the ground floor, it may be suitable for people with mobility reduced.It consists of a double bed 160 x 200 (separable) and a meridian of 80 x 190. 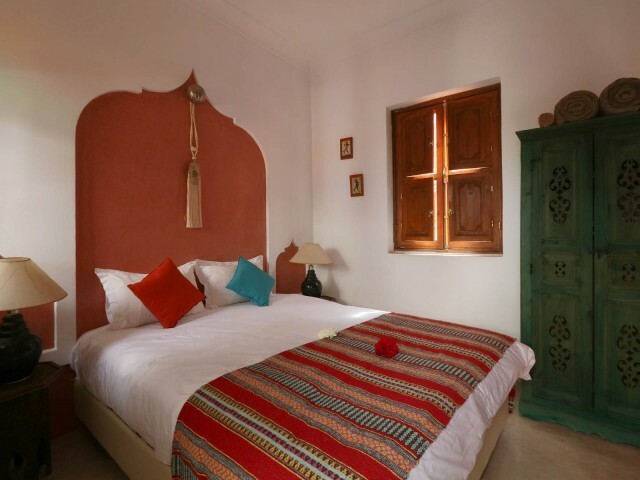 (ideal for a child's bed). 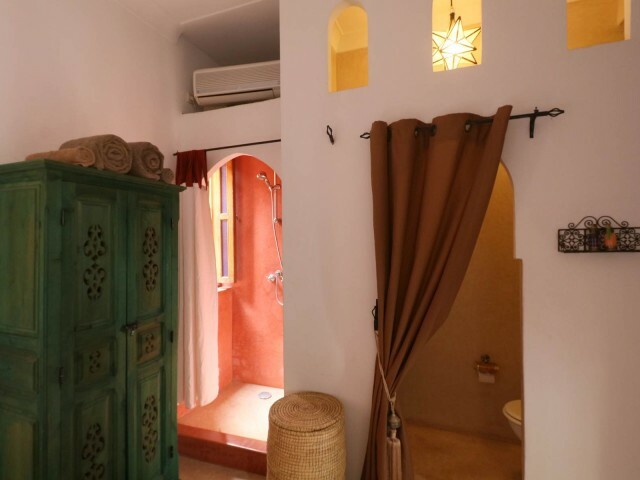 Vases found in Zagora, canvas painted by Mali and fabrics Berbers make up this decor authentic.Continuity in its en suite bathroom on the walls of tadelakt natural.Reversible air conditioning provides comfort and modernity in this sequel to the warm colours of the South of Morocco. 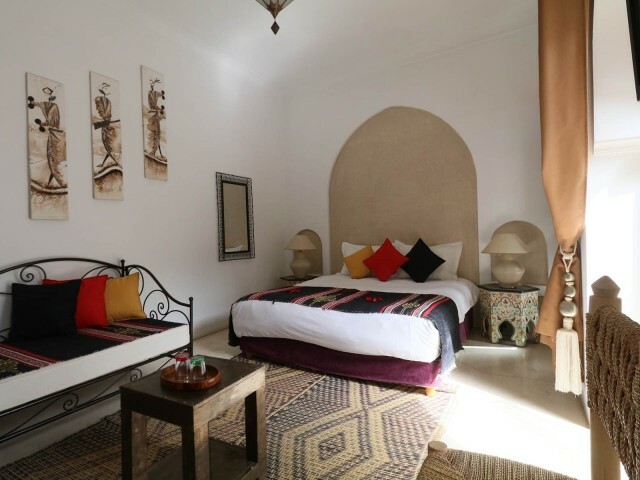 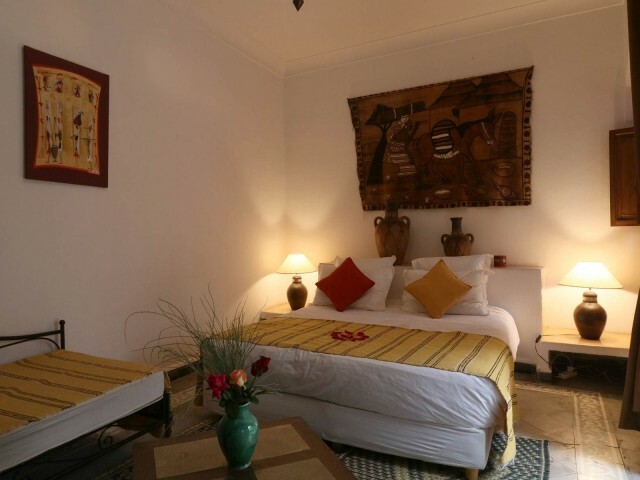 Located on the 1st floor, it consists a large bed 160 x 200 (separable) as well as of a meridian of 80 x 190 (ideal for a crib).White, Brown, black and a touch of red, Gnawa, tables zouakee characterized the atmosphere easy and refined this suite Ouarzazate. 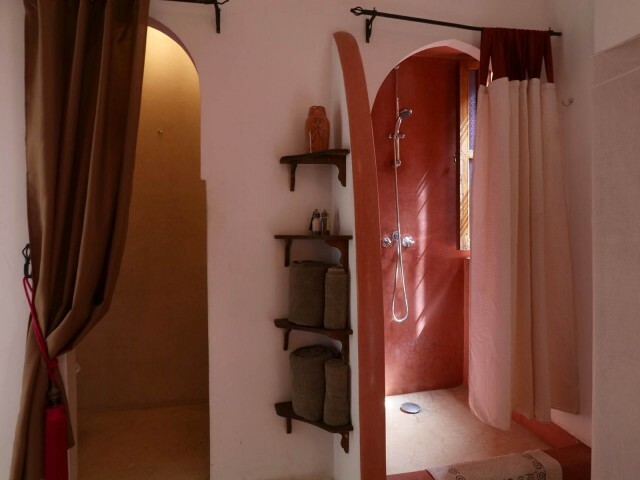 Continuity in its en suite bathroom in natural tadelakt walls.It is also equipped with a reversible air conditioning. 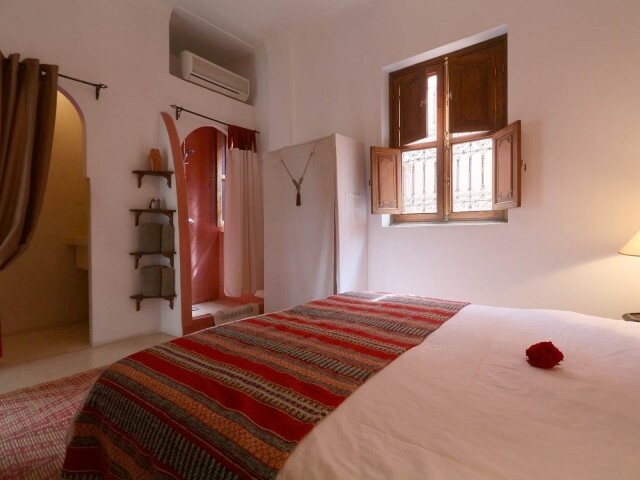 Located on the 1st floor, it consists of a double bed 160 X 200 and a meridian of 80 x 190 (ideal for a cot). 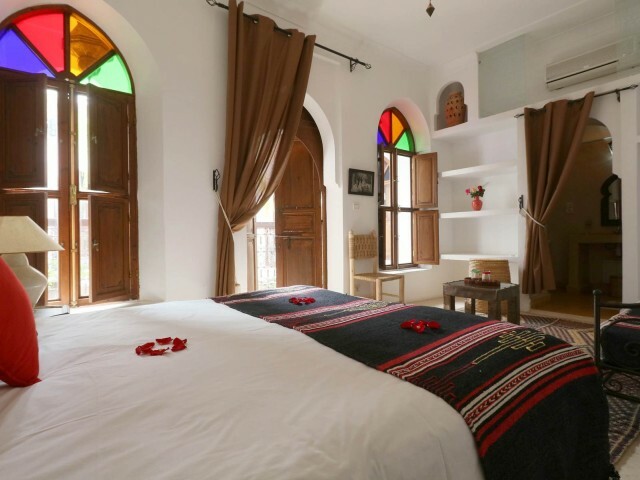 Mat mosque natural cane, old engravings, Cabinet zouakee, a note of turquoise reminds us zelige from the patio, the suite Fez combines elegance and serenity.In continuity lies also private bathroom in natural tadelakt. 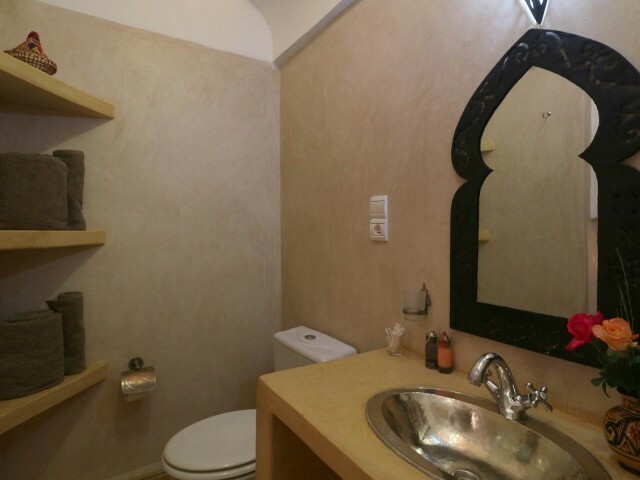 It is of course equipped with reversible air conditioning.